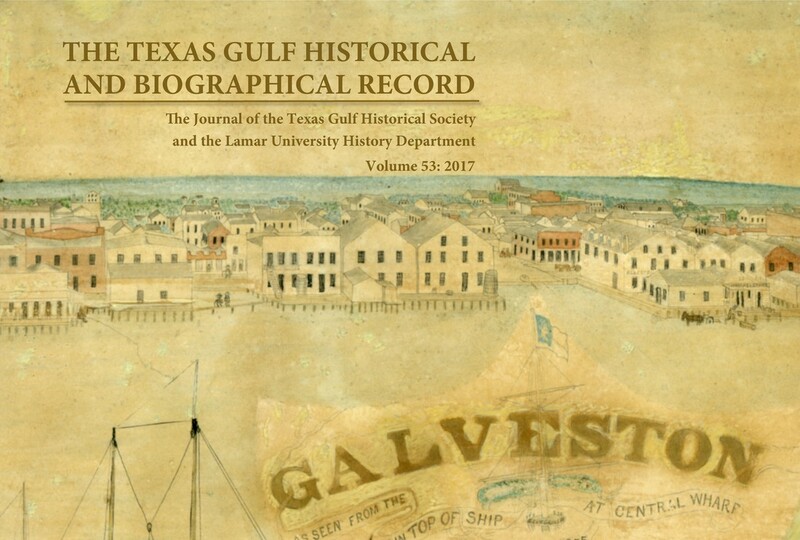 Issued since 1965, The Record publishes multidisciplinary articles and edited primary sources focused on the history and culture of the Texas Gulf Coast and Southeast Texas broadly conceived. We encourage submissions from authors and scholars of diverse levels of experience, expertise, and backgrounds. In this issue, Joe W. Specht explores the music inspired by the Southeast Texas oil industry. Often expressing working-class angst, local blues and folk artists, country and rock superstars reflected the good times and bad times that characterized the boom-and-bust oil market. Ken Poston revisits the 1947 Texas City disaster and focuses on how its impact reached Southeast Texans. Lamar University history major Rebecca Phillips searches through old year books and finds glimpses of 1920s culture at South Park Junior College. For this volume’s "Biographical Notes," Matthew Pelz examines the civic and business contributions of George W. Grover of Galveston, and for "Primary Sources," Charlotte A. Holliman provides a sampling of the treasure trove that is the Rolfe and Gary Christopher Negative Collection. For more news, updates, announcements, follow The Record on our Facebook page. Vox audita perdit, littera scripta manet.